A delicious way to use up the abundance of zucchini. No garden? Zucchini is available year round in stores. Place shredded zucchini in a sieve or colander and sprinkle with salt.† Let drain over a bowl at least one hour.† Press to release excess moisture. In a 12-inch oven-proof skillet, melt coconut oil over medium heat, swirling to coat sides of pan.† Add zucchini, spread evenly across bottom of pan and cook 5 minutes. 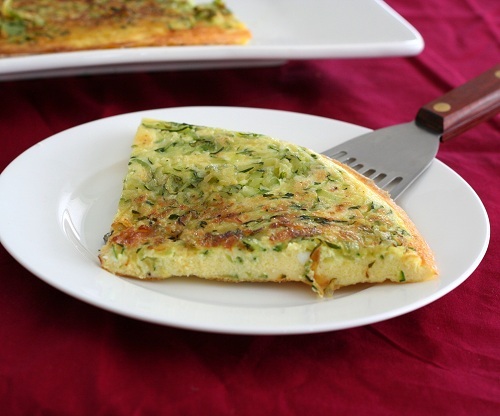 In a medium bowl, whisk eggs, Parmesan, garlic and salt and pepper until well combined.† Without disturbing zucchini, pour egg mixture into skillet and reduce to medium-low heat. Cook undisturbed until sides are set but center is still loose, about 7 to 10 minutes.† Meanwhile, place oven rack on second highest setting and preheat broiler. Broil frittata until puffed and lightly browned, about 5 minutes (watching carefully so it doesnít burn). Remove from oven.† Cover skillet with an inverted serving plate, then flip skillet and pan together so that frittata is transferred to serving plate.